Home › Grace › Betrothal to the Bridegroom: Most Virgins Today Have Refused! The Bridegroom has made an offer of Betrothal to the Bride. He is now waiting for the Bride to accept, or not accept, His Betrothal offer! In each of these passages, Yahshua is revealing to His Disciples the “prophetic” meaning of the well-known Passover meal, practiced for centuries by all of Yahweh’s people. Yahshua did not institute anything new, or change anything. He merely revealed the “true” meaning of Passover . First, we see that the original offer of Betrothal came at Mt. Sinai, where the Covenant Promise of Betrothal was sealed in the “Blood of the Testament” which prefigured the Blood of Messiah. (To see the account in Scripture of the Betrothal Agreement, see The Two Witnesses of Devarim.) Most importantly, the blood was sprinkled on the “Tabernacle” and all the “vessels of the ministry.” Beloved, this pictures the physical Blood touching the physical items of the tabernacle. We are now in the “Tabernacle” of this fleshly body, the dwelling-place of Yahweh (1Co 6:19), and as such we must be sprinkled by the physical Blood of the Covenant, again representing Messiah’s Blood. This covenant “sprinkling” is done when we participate in the Body and Blood of the “Passover” meal. 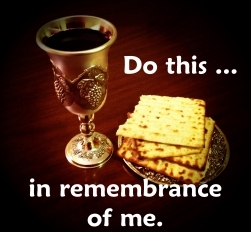 When we drink of the Passover cup, the “Blood” of Yahshua goes down into “this tabernacle” of our body (2 Co 5:4). Our drinking of the Passover cup, just as the Bridegroom did, becomes our “half” of the Betrothal agreement. Beloved, unless we “accept” the Betrothal offer of the Bridegroom, by taking the Passover Body and Blood, we have no “eternal Life” in us; indeed, it is “Messiah-in-us” who prompts us to participate in the Passover! It is likewise the lack of Messiah-in-us, that causes us to reject this Passover participation. This rejection of the True Passover is perhaps the origin of thecounterfeit Passover, called communion and Lord’s Supper, that most of us in the Evangelical world have embraced as a substitute for the True! The keeping of “Passover” is the eating of His Flesh (His “Life” per John 6:51), and the drinking of His “Blood” (His “Life” per Lev 17:11). The Second Passover of this season is the final opportunity for the Bride. This will occur on the 14th day of the Second Biblical Month, on a calendar date determined in mid- to late- March of each year. Beloved, the Bridegroom wishes you to become Betrothed!! Find several others, or have the Passover alone. Let us keep the Feast! (1Co 5:7-8). Unless the Bride Candidate takes the Flesh and Blood of Passover, she demonstrates she has “no Life” in her. Participation in the True Passover demonstrates the presence of the “Life” of Messiah-in-us, who gives us the ‘Grace’ for the obedience we need to “enter in” to the presence of the King. Pastors, Ministers, and spiritual Leaders, direct yourself and your people toward the Scriptural practices, and away from practices and Doctrines of Men that you may have picked up in your Theological Seminary, Bible School or Denomination. We will each be held accountable for our respective works! (Rev 2:23). The Way of Truth: According to the Scriptures – Truth is seen in Scripture not as an abstract, mental idea, but as the living person of Yahushua. It is only when we allow Messiah-in-us to walk in His own Truth, that Truth is made manifest to us, and we then walk in the Light. Scripture reveals the consequences of walking in Truth, and of NOT walking in Truth. The Doctrine of Balaam: A Warning to the Bride – Yahushua warns His people of this error, which has been embraced by most Believers today; which causes His people to commit sins, and brings a plague on entire congregations; Messiah will fight against all who do not repent, who continue to hold this error. ‹ The Master Delays His Coming?! I don’t understand the difference in this Article between what the writer states about participating in in the Body and Blood of the Passover meal and the Body and Blood of today’s churches? The dates make sense. That’s a good question Linda. It is very important that we see the difference, so that we can choose wisely. Most churches take communion (Lord’s Supper) often, perhaps monthly, weekly, or daily. The Biblical Passover, however, is observed once yearly. Communion (the Lord’s Supper) is taken in the daytime, night time, or any time one chooses. The Biblical Passover meal, however, is to be eaten only after sunset. The Scriptures prescribe the month, the day, and the hour the Passover Memorial meal is to be eaten. Communion (the Lord’s Supper) is taken alone, by itself, and not a part of a larger and highly significant Covenant event. 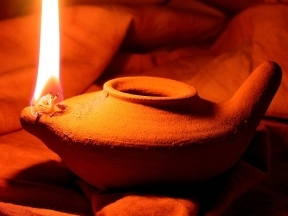 The Biblical observing of the Passover, however, is a one-night event that takes place with much preparation, including removal of all leaven from the homes, and with telling the story of God’s judgment on Egypt. Passover is also the preparation day for first day of the 7-day Feast of Unleavened, occurring the next day after Passover, in which no leaven is to be eaten for 7-days. Communion (the Lord’s Supper) is taught as a single event detached from the entire Scripture account of the history of God’s dealings with Israel. Our participation in Passover, however, [and all the other Feasts commanded by Messiah in the Old Testament] is a participation in that history. Our participation in Passover is also a recognition that by faith in Messiah, we are grafted-in to the citizenship of Israel, and that we now share the promises and blessings, as well as the Covenant provisions of Israel. It is showing Messiah that we love Him (John 14:15).